You can’t get a ticket to this year’s Super Bowl for less than $2,000 anywhere right now, but it wasn’t always like this. 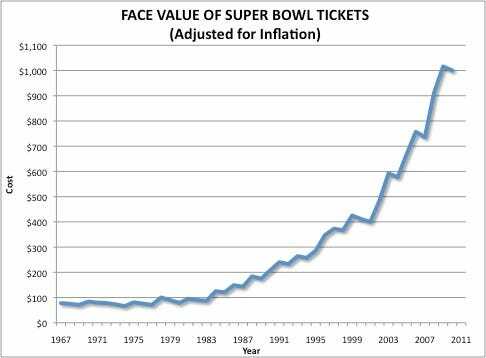 Face value tickets soared up to $1,200 for Super Bowl XLV, but as recently as 2004 they were selling for less than $200. That’s not saying the Average Joe would have had an easy time getting Super Bowl tickets that cheap, he still would likely have had to buy them through a secondary market. But the ridiculous prices you see on StubHub today are a relatively new trend that’s coincided with the explosion of the NFL. *Data from The Dallas Morning News and Sports Business Daily. **A few years offered more than one price, we used the highest. ***Inflation prices calculated using the CPI Inflation Calculator from the Bureau of labour Statistics.